If I could gift everyone the sense of freedom I feel on my bike I would. Being on two wheels has always felt normal to me. I’m 6 years old, my mum’s friend has given us an old bike. I’ve jumped onto the two wheeled mountain bike and I’m circling my grass lawn, round and round, I’m managing to control this weird contraption within the confines of the lawn, outlined by the flowerbeds. Without hesitation, I’m able to ride a bike. First time – it’s like a fish to water. And I’m grinning. I’m so happy and I feel so free. I kept cycling most of my adolescent life – my friends and I would take trips, all on our bikes around Edinburgh, circling through parks down to the beach. I remember most of my bikes fondly – but I still never considered myself a serious cyclist. I just used it to get around quickly and cheaply, and I guess it kept me reasonably fit. I didn’t have special bike, I wasn’t really fast, and I’d get pretty wet in the Scottish showers. During University I’d owned a pink Peugeot with French style handlbars and cycled it around fairly frequently. Somewhere along the line, I lost touch with the bike after university. The year I left University, I set up a business and I got lazy. I stopped cycling and piled on the pounds, working far too many hours and eating badly. I got pretty ill, and mentally unwell too. In 2013 I bought a bike, the one I ride today. He’s called Lost Boy. If there was an inanimate object I could marry it would be this one – to the point I have nightmares that one day it might stolen. I bought him from a bike messenger who’d hand built him, and given him the name Lost Boy. He’s perfect, the best bike I ever owned. With intent, I started cycling him 15 minutes a day to get fit, then 30, and all of a sudden I was out most nights on Lost Boy for way over an hour. I credit the bike with changing my life. It gave me back freedom, confidence and well fitness, I completely transformed. And I still ride him nearly every day today. Enter Jo – Bikeable Jo. We’d met through work and in 2013 we grabbed a coffee, at Jo’s request – she’d seen a talk about re-desinging streets and cities. I’d always had ‘barriers’ to cycling but I’d never really thought we could do anything about them. We both had a love of bikes and common interest in design and were fed up with the aesthetic of standing shouting/complaining one by one at an official from a local authority about the state of the roads. We knew there was loads of work going on in this arena around road and infrastructure improvement, so we wanted to come at a different angle, from the perspective of the total experience of cycling. We got excited about the potential of multi disciplinary groups coming together who all wanted to make places better for people to cycle. We pinged round an idea about doing a hack event – we’d been to a few and through our work at Snook, we’d run similar events, using the design process to look at challenges from various user perspectives. 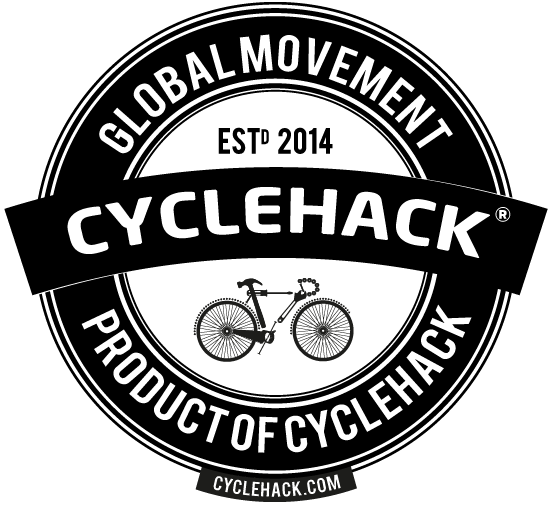 We coined the term CycleHack – and put together a simple plan. Make a kickstarter, request a low amount and put on one event. We then met Matt who joined the team as a founder in the early days – Matt’s probably got the most bike orientated knowledge out of us, but what I love is that we’re all just generally people who get on bikes. CycleHack is a labour of love. This isn’t our regular job, infact Matt, Jo and I squeeze much of the work in-between our already pretty hectic schedules. So why do we CycleHack, what keeps us going? I mean, so far, we’re up to 42 cities and I love the fact we’re continuing to stimulate new conversations, groups, friends and ideas around the globe. It’s amazing, the guys at CycleHack Manchester have run regular events since joining last year, I love that we were the catalyst and we stimulated a new enthusiastic, a-political, two wheeled civic hackers. I also get to meet amazing people around the globe who share the same values and take me for bike rides in the cities I’m visiting! I love putting design in the hands of people, in particular those who have never encountered making something or bringing form to an idea. We’ve had so many amazing comments from people who have had ideas for years, or problems they want to solve come to CycleHack and see prototypes built in under a few hours. This transformation in what’s possible is amazing and can really give people the confidence that they can make change happen. We have an emphasis on gaining traction with ideas post CycleHack – it’s not easy to do, particularly with some of the ideas based around infrastructure but we have seen teams like CycleHack Brussels meet the Minister for Transport. Outputs aside, the process to get there is just as valuable and I love seeing people sharing, connecting and having fun around the topic of cycling. During the hack, people genuinely have an amazing time, it’s like a party you have to work hard at. Lets not beat around the bush, often change and cities can be full of unseen power, politics and negativity. In the CycleHack space, there is nothing but a positive atmosphere and if some of this can be taken, continued and implemented into organisations there after, that makes me feel positive we can start new ways of working. Well we’re trying. We’ve already lost the ability to keep track of all the new initiatives, conversations, products and knock on effects CycleHack is having around the globe. But in so many senses we’re having an impact, and the people who run the local chapters are pushing hard to bring their events to life. Some days it’s hard to fit this all around our day jobs, but writing this post, reminding me why I CycleHack definitely keeps me pushing to scale this and grow our network even further. If you feel like me, and want to make cycling easier where you live, sign up your city or place here, there is still time to pull a CycleHack together before the 24th June.